That obviously wasn’t enough for the black students on campus. Members of the Darkening, a student-led, racial-justice community organization, took matters into their own hands, literally. 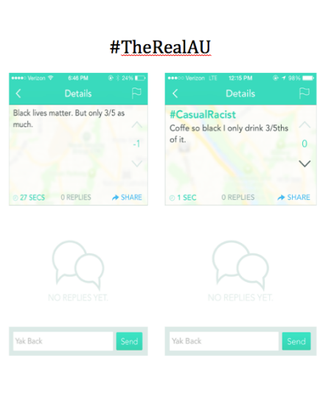 They started taking racist messages that were posted on Yik Yak and posting them around campus. Of course, those posts didn’t last long. So a student actually reached out to the media to explain what was going on. As someone who attended a university where diversity was definitely lacking, I understood what the students were dealing with. Back in my day (the mid-’90s), we didn’t have apps like Yik Yak, where people could anonymously express their hate. Then, it was more in your face. Apparently, by going to the media, the students got their voices heard, and received a response via another memorandum. First and most importantly, we encourage dialogue. We want all students to work with us and with one another to effect the climate on campus. Orientation for all incoming first-year students includes diversity and microaggression discussions to set the tone for interactions as students proceed through their years at AU. Residence hall assistants are provided training and encouraged to create inclusive communities. This semester, we stepped up our work with the faculty to develop their abilities to discuss issues in the classroom in inclusive and respectful ways. Our goal is to further enhance these curricular efforts over the next few semesters. In 2012, we opened our Center for Diversity and Inclusion which serves as a liaison for students, faculty and staff, and provides resources to enhance education, outreach and advocacy. Yik Yak is problematic because it is anonymous and it allows people to hide behind offensive and hurtful comments. These posts are acts of cowardice and we hope people recognize them as such. Although the university doesn’t have the ability to take posts down, any student who feels a threat to their safety is strongly encouraged to report it to Public Safety and/or the Dean of Students Office. We have the resources and procedures to work with students. Students and the community have the power to ‘down vote’ any post and get it permanently deleted with just five down votes. As an institution, we are a microcosm of the larger society and we recognize there is important work to be done on race relations. In a conversation with Daniel Marks, an organizer with the Darkening, he noted that although these Yik Yak messages are anonymous, some students have done a poor job of covering their tracks and he’s spotted a few of them on campus. As Aw stated, Yik Yak is anonymous, but when people slip up and then get exposed for the racists they truly are, I think there will bigger issues on American University’s campus that aren’t going to be easily solved by a memorandum.